This is a snack bento that I made last Saturday as a last minute request. 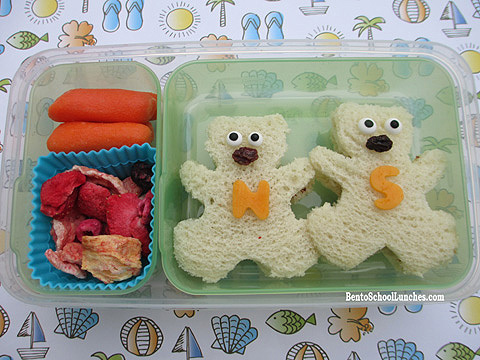 N represented his school for a competition last Saturday and lunch was provided, but as soon as he woke up that morning he came with a bear cookie cutter and said "Mom, can you make me a snack bento and I want bears". Mixed fruit crunchies natural fruit snacks. Nutella and SunButter bear shaped sandwiches with candy eyes and raisin nose. Here are the items that I used to make this snack. Such a cute snack! I love that he wanted a cute snack made by Mom!